contacted the Model Land Company, which was Henry Flagler’s land development company. Frank Pepper, one of Model Land Company agents, knew of some land in Boynton that the owner, D.P. Council, wished to sell because he no longer could afford the taxes. The land was located on the southeast corner of Woolbright Road and Military Trail, and later was Herb Keatt’s dairy and today is the Indian Spring development. Mr. Council was even willing to give 40 acres of the land if the Model Land Company would extend the road to the colony, probably following today’s Woolbright Road path. In a February 1923 letter to Prof. Minsos, T. T. Reese of West Palm Beach wrote “I want to say a word regarding our summer climate – they will find it delightful in every way. We, at times, have insects, but I have never found them a menace to happiness or comfort.” I can say with certainty that they would not have found the summer climate delightful. 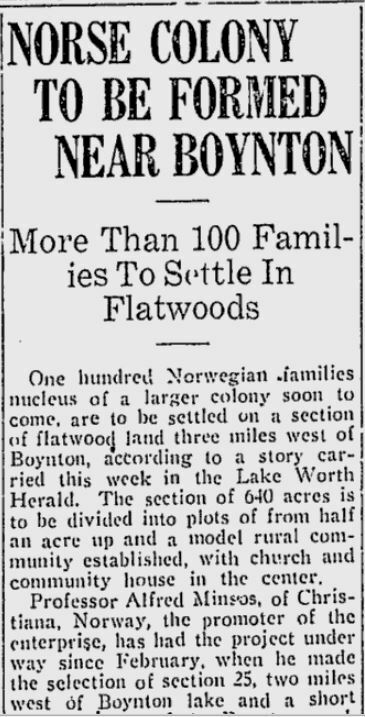 But the Norwegians never came to Boynton. No documentation was found if they went to somewhere else in Florida, and I didn’t find any other information on Professor Minsos. Lutefisk , a strange fish dish where the fish is preserved in lye and smells real bad, could have become a local delicacy. Maybe it’s a good thing they didn’t come.